So! This post is long overdue! This has been my favourite drama of the year (up high in the rank of my all time favourites, for sure), and I wish nothing but write about how much I loved this drama, but alas! time has restricted me to express my obsession with this drama. My BluRay copy of this drama is coming out soon, sooooo I'm very excited to own that. 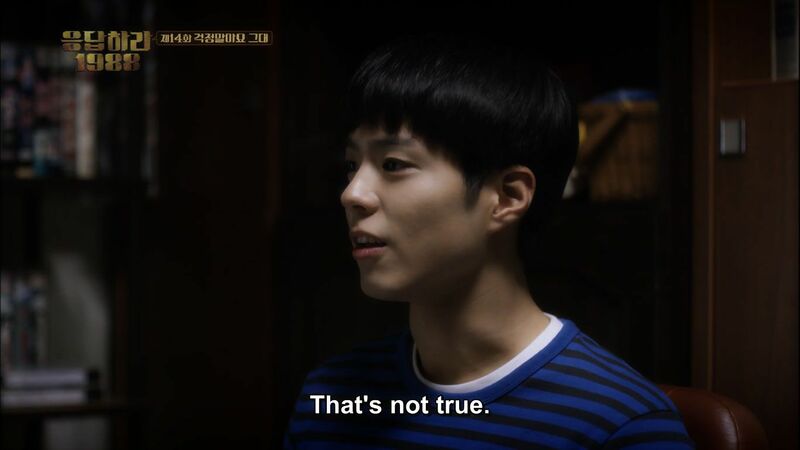 Reply 1988 is the third installment of the Reply series. 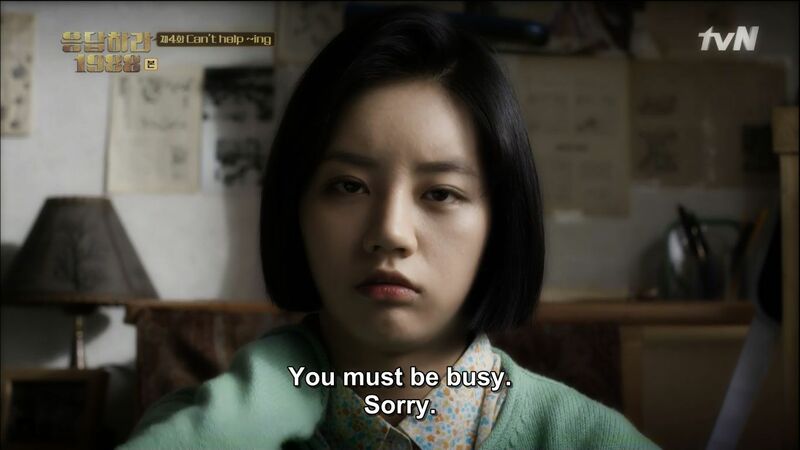 I talked about how much I fell in love with Reply 1997 and wished that I had discovered that gem during its run. I totally missed out on the fun of being cliffhanged and the countdown just to see a new episode. I made sure this time not to miss out on 1988! I thought no installment could ever top my love for 1997. I mean, 1994 was a good run, but I wasn't fully invested in any of the characters. My love for 1988 was just on a whole different scale. I loved it from day 1, even though I jumped on ships way too many times until I decided to fully board and be faithful in one couple. 1988 takes you back to how people were like with no technology to depend on. ^I love this scene so much. Duk Seon tapped Taek's bum asking him to drink his milk well, so that he can grow up faster and marry her. Little did we know, that's what exactly Taek did. He grew up and married his childhood best friend. This post will be heavily Taek and Duk Seon-biased as I talk about how beautiful their love story is and how much I am smitten by their unconditional love for each other. ....that three decades later from that day, she and the son would marry and create their own family. What they needed was time to grow together and slowly build memories to look back on. Each and every episode, there was no moment waste of SunTaek scene. Each scene you'd see them either grow personally or as a couple. You'll definitely learn more about them in each scene that they were together. This was the very first scene that piqued my interest of their relationship. 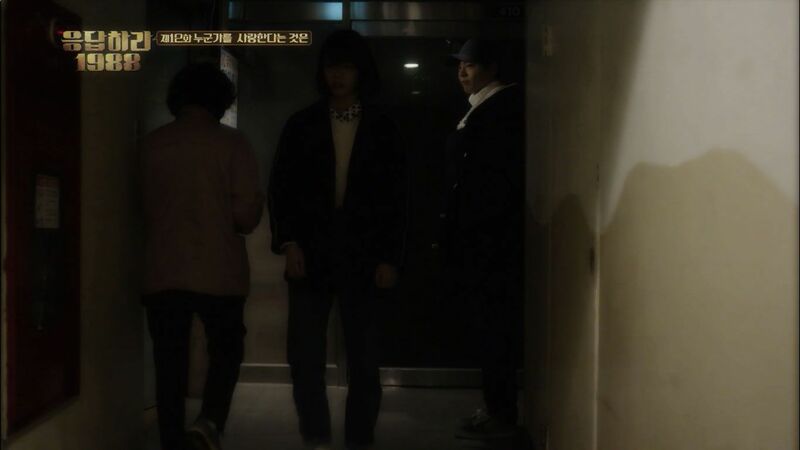 In Episode 6, the group lined up at Taek's door to congratulate him on his win. He was all smiles and hugged each of them, but when it was Duk Seon's turn (she was last in line), I don't know if it was pure shy or what, but she suddenly busied herself by removing her jacket and somehow wanted to avoid hugging him. 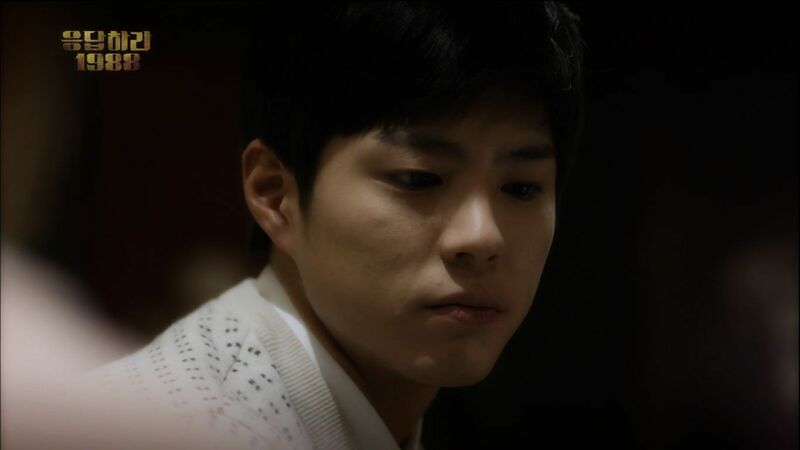 Taek's look at Duk Seon was so different in this scene. It was like he was anticipating a bigger congratulation and a hug from her, but when she didn't, he took that first step, grabbed her in his arms, and held her tightly. I think deep down, even though I wasn't fully on board on this ship called SunTaek yet, I squealed right at this moment. I thought it was adorable that perhaps Duk Seon was being self-concious and somehow didn't want to give him a hug like the other boys, but Taek took that step and held her anyways! This was definitely the start - whenever Duk Seon wavers, Taek is always ready to take that first step. That scene wasn't the only memorable one in Ep 6. Here was also the first time that Taek was officially introduced as the husband contender. Confession at first snow of the year 1988. 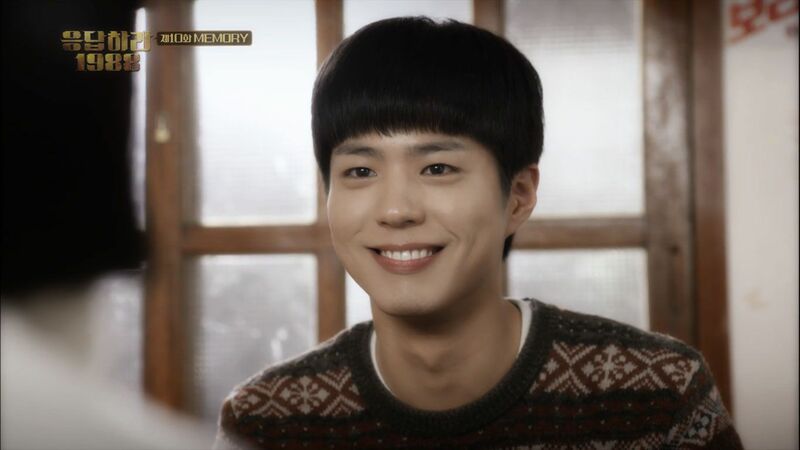 When the group gathered for pizza after he won a Baduk match, they talked about confessing your feelings to the person you love as soon as the first snow was sighted. Duk Seon was heartbroken after learning that Sun Woo had liked her sister, Bo Ra, all this time and bawled her eyes out. However, that scene became 'forgettable' the moment her home phone rang and on the other line was Taek asking her to go on a movie date - just the two of them. She was heartbroken at the fact that Sun Woo never had feelings for her, but what she didn't know was somewhere out there, somebody was silently loving her, just bidding his time to confess and let his feelings be known. And this was once again the start - Duk Seon doubted her ability to be loved and adored by somebody, but Taek had always been there silently loving and completely charmed by her. In episode 7, Duk Seon was left heartbroken once again - her confidence plummeting further due to the fact that the Ssangmundong kids had their Secret Santa event, however on that day, nobody had given her a Christmas present. The fact that she didn't even have a clue on who picked her name out was the last straw for her. Right from the start, she wanted Taek to be her Secret Santa. Taek, however, showed no signs whatsoever that he picked her name out nor even in the least interested or remembered about the Secret Santa event. Her self-esteem dropped lower and she had lost confidence in finding that somebody to appreciate her. Taek had completely forgotten about the Secret Santa event since he had a match on that day, and he was busy preparing for his father's birthday. But once he realized that he was Duk Seon's Secret Santa, he rushed out of his house and apologized to Duk Seon right away for forgetting her. He didn't even defend himself as to why he forgot about it - none of his excuses would matter because either way, Duk Seon's feelings had already been hurt. So he cleared up the misunderstanding and promised to give her a present that she wanted the most. Because of that, Duk Seon didn't end her night heartbroken and feeling unloved. Once again, Taek took that first step to cheer her up, letting her know she is no where near forgotten. So it makes perfectly sense, that Duk Seon would pick Taek's mittens over Jung Hwan's gloves because the meaning behind those presents have deeper impact on her. Taek's presents made her remember she wasn't "unwanted" and "forgotten". I honestly think, deep down, Duk Seon was becoming much more self-conscious with Taek than the other boys unknowingly. Other than that scene I have mentioned above, back in Ep 6, this scene here in Ep 8 made me feel giddy. 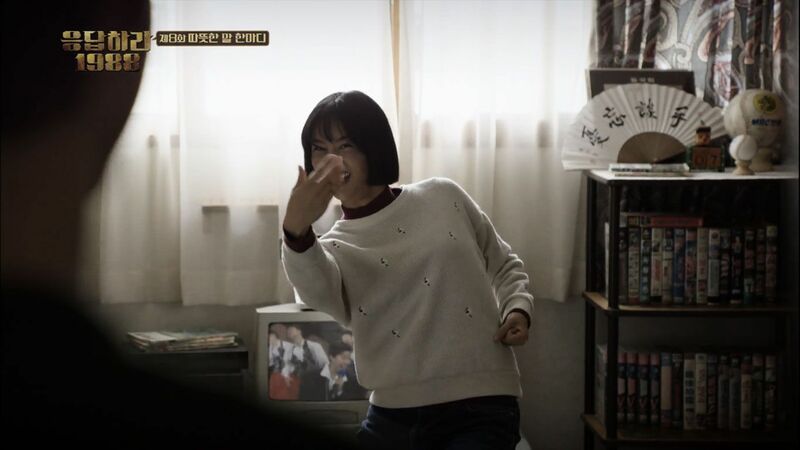 Duk Seon was doing silly dances in front of her friends which obviously dismayed Jung Hwan because the boys discussed how girls wanted to look cute in front of the boy they liked, and Duk Seon wasn't doing any of that. When Taek stepped into the room, her silly dance turned into something bolder and sexier by throwing him a virtual rope to make him come closer to her! When I first watched that scene, I think I fangirled at the change in Duk Seon's dance. I liked that how she acts differed in whoever was around her - Taek came, and her dance suddenly became not so silly anymore. I would also like to take this moment to mention that this was the scene where Taek had won me over. I still wasn't fully shipping him with Duk Seon, but I became much more interested in his character with this scene. It made me realize how much brighter the world was when Taek beamed like that. It never fails me to break into a wide smile as well every time I watch scenes with Taek on full, wide, beaming on the screen. I mean, this is the Stone Buddha we are talking about here! He's known to be expressionless, but when he does execute facial emotions, it totally hits you to the core. That was the very first time I wish that he may never lost that smile. Duk Seon was very fond of patting Taek's head like he was a baby, but he obviously did not appreciate that especially when she talked to him in a baby tone as well. He didn't tell her verbally how much he didn't like that, but he showed it subtly by doing the same gesture to her instead. And so from then on, Taek took over; he was the one who patted her head and she seemed to be liking it too! ^Two different scenes from Ep 13. ^and six years later... from Ep 19. Some things never change.... I guess. Another thing that caught my interest, despite how subtle this scene was - Duk Seon putting a meat on Taek's rice in Ep 9. It's such a tender gesture; it made my heart warm. Viewers saw this gesture as a "motherly" care for her child, but I thought otherwise. Duk Seon was always hungry for food - from the start, she always had to share her family's small meal with her siblings even though she would want more for herself. Here in this case, there was plenty of food - she was eating to her heart's content, but she would still want to share that with Taek. Not to all the boys at the table, but just to Taek. She wanted to make sure that he, too, was well fed like her. I also appreciated this scene from Ep 9 because they shared food either way. Duk Seon can put food in his bowl and can take some from his too. I think this contrasts the disgust on Jung Hwan's face as he watched Duk Seon gobble down her food. He didn't like her unlady-like table manners, but Taek didn't mind it at all that she stole food from his rice bowl. 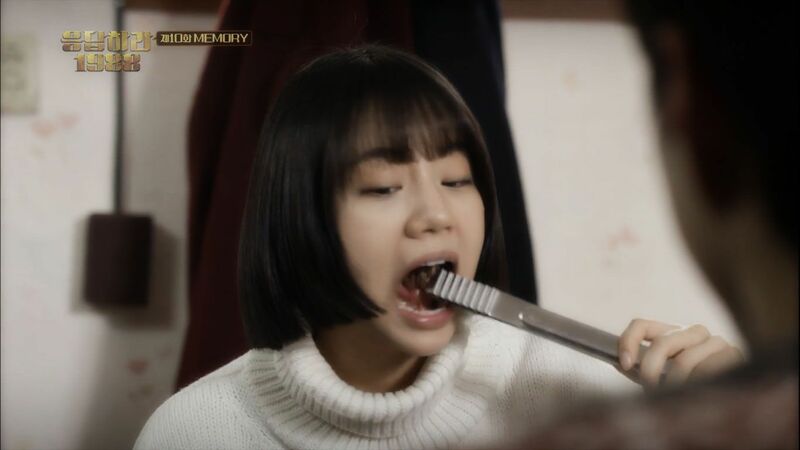 There were two specific scenes in the drama that showed a contrast in Jung Hwan and Taek's reactions at how Duk Seon gobble down her food. 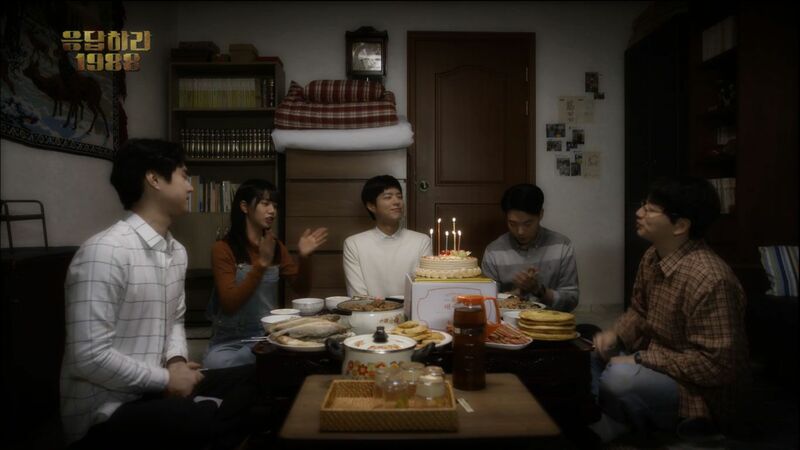 That scene I had just mentioned and the scene from Ep 10 as Jung Hwan watched Duk Seon and his brother have a cake-eating contest. 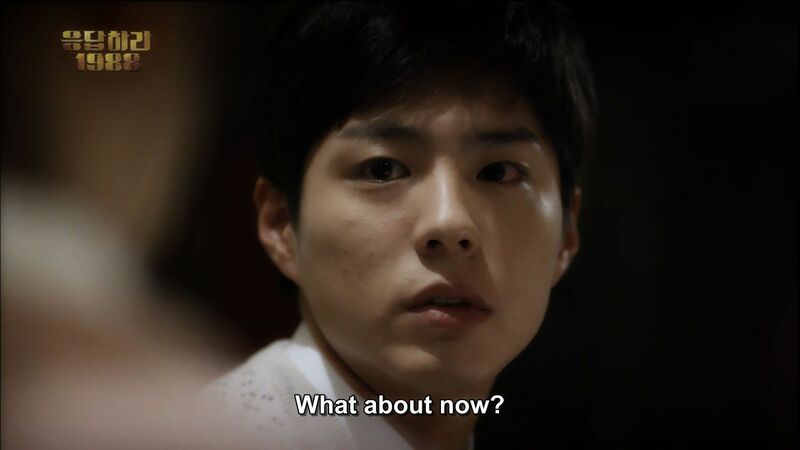 I would say, Ep 9, was when things got a little serious and had a lot character development between Taek and Duk Seon. This episode somehow changed the couple's perspective of each other. 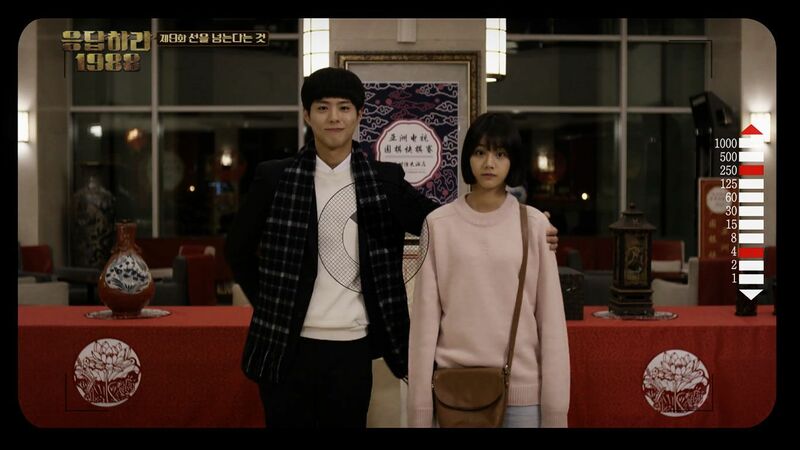 Duk Seon went to China to accompany Taek for his Baduk match. This was the first time she stepped into his Baduk world and witnessed how important Taek was in this field and how tiring and overwhelming this world was to him. Duk Seon, seemed not be herself whenever she was around Taek in China. She fidgeted and toned herself down whenever Taek was around. If she was around his manager and the cameramen, she was back to the being Duk Seon - lively and carefree. I mean how many times had she gazed at Taek that way, observing and seeing him in a serious light? Taek smoked! It shocked her internally that he was already at that age that he could and was allowed to smoke. It surprised me that, once again, she wasn't her usual self. If I were to be really honest, if this was the usual Duk Seon, she would never condone smoking (just like how her father freaked out that this youngest son smoked, in Ep 1). She might have slapped and hit Taek all over. But she didn't. Rather she stepped aside and never brought up his smoking habits. It was like she already accepted that smoking was going to be a part of him. One of the most memorable in Ep 9 as well was this scene. Duk Seon didn't understand Baduk etiquette - that even if you won the match, you were not to show any experession of victory. This was what Taek had mastered all his life, hence, his nickname of Stone Buddha. But as he found Duk Seon in the crowd, beaming and waving at him, he couldn't help but automatically return the gesture. As I have mentioned, this Stone Buddha doesn't show a lot of expressions, but he does, it hits you right to the core. Only Duk Seon can make him act out of his character. And right at that moment, Taek's future flashed before me. I pictured him to be at his matches, with his wife accompanying him, supporting him, and as he looked for her in the crowd, she would be there smiling and waving at him. Little did I know, I was actually given an opportunity to take a peak of what the future would be like with Taek and his wife. This episode wasn't only the turning point of Duk Seon's new perspective of Taek, it also marked how much Taek fell for her even more for all the silent gestures she did for him that he eventually found out. Taek's manager and the cameramen thought Duk Seon was useless in this trip to China. She only ate, and ate, and ate, without caring much if Taek had eaten or even slept. What they didn't know was, before Duk Seon even did something for her own benefit, she had made sure that Taek was well taken care first - just as always. He was able to eat his favourite food, slept really warm and well because she brought her household's electronic comforter to China. He was also able to wear warm and matching attire because she had made sure that she brought him proper clothing. I honestly saw her right there as a wife material who would make sure everything was well and prepared for her tired husband. Back in Episode 3, we know how much Duk Seon loved to go on a trip. On their trip to the countryside, she made sure that she had so much fun with her friends, dancing and singing on the bus. You would think that she'd spent the rest of her time in China having fun and touring the city. But she did none of that. When she could have been touring around China, she stayed and waited till Taek's matches were over. When she could have had the best food in town, she lined up in the freezing cold just to get Taek's favourite food at this famous restaurant. She did so much without taking any credit for, and when Taek found out all about it, he couldn't help but fall in love with her even more. She was only 18 at that time, yet she was very sensible and perceptive to Taek's needs. January 1989 was obviously a memorable moment for them that even kept a memory of it three decades later. Something had obviously changed in Ep 9, because in the rest of the episodes, we have seen a much much closer Taek and Duk Seon. We were shown a lot of scenes that proved that they could have fun with just the two of them, even without the rest of the Ssangmundong kids. Take for example this scene in Ep 10. Duk Seon and Taek were left on their own to go back home. But they did not go home immediately - rather they took their time - had lunch, coffee on the beach, and played in the water. There was no moment wasted with these two. They could have fun without anyone telling them what to do. They played and spent the time together until the sun had set. They had a lot of moments like these where I feel like they're a couple at their retirement age and all they do is just gaze into the horizon, feeling in the nature with cups of coffee in their hands. This scene in Ep 11 had me taken a back the first time I saw it. I didn't put any meaning to it, but it left me pondering and kept this scene in the back of my mind. This was around the time Duk Seon was still pursuing Jung Hwan. Prior to this scene, Duk Seon was supposed to sit next to Jung Hwan and have lunch with him and their families. However, Sun Woo's mom asked Duk Seon to bring food Taek who was in his room, working. Duk Seon could have left the food in his room and gone back to Jung Hwan side. But she didn't. It amazed me that she would choose to sit by his side, read manhwa, just to make sure he ate his food. She wouldn't have done the same with any of her siblings for sure. Now, that scene right there finally made sense to me. She would exchange all the fun in the world for that moment to be with him. She'd read manhwa or do other things while he worked, and life would still be perfect. As long as she is with him, that to her is happiness and she's fully content. If Ep 9 marked how Duk Seon saw Taek in a different light, I would say this scene, here, as Taek's turn to see Duk Seon in another light. Duk Seon was perceived as, and even she, herself, wanted to be perceived as, the fearless girl. The Ssangmundong neighbours know that adventure was in her streak. Take for example that scene where Taek and Dong Ryong were scared the hell out of mice, but Duk Seon bravely got rid of them. In addition, prior to that scene I posted, Dong Ryong and Ja Hyun mentioned (in two different scenarios) about the exhibitionist in the mall, and how it scared everybody. Duk Seon bravely told both that she would love to see the exhibitionist herself. Dong Ryong even emphasized that Duk Seon's only weakness was her sister Bo Ra. So when the exhibitionist really did appear before them, both Taek and Duk Seon of them were as shocked. Duk Seon managed to shoo him away, but her knee gave way eventually and started bawling. Taek panicked, looked all over the place, didn't know what to do, as this was the very first time he saw Duk Seon break down like that. Taek saw Duk Seon in a different light here. She was not as fearless as she what she tried to percieved herself as to everyone. "Don't tell anyone about this. ", she asked of Taek. She did not want anyone to know, but Taek had found that, that she was just like any other girl - who gets scared and breaks down when something scares her. Taek put this new realization in the back of his brain, and so the next time Duk Seon had to go to the bathroom, he knew how to handle the situation. He was aware of her weakness, and so he did such a swoon-worthy act by assuring her that he was never going anywhere. She could go do her business in the bathroom without worrying about anything because he`d be right there by the door. He would look after her. Soooo sweet. Their dynamic is just simply amazing. This post is already soooo long, but I`m not even half way done talking about how beautiful their relationship is. I could go on and on and I would still find things that would make me fall for Taek and Duk Seon more. Taek lets Duk Seon take care of him. He indulges her to do things for him. But where Duk Seon lacks, Taek is quickly to fill in and becomes her superman in an instant. This scene in Episode 13 made me remeber that little scene Taek and Duk Seon had back in Ep 4. 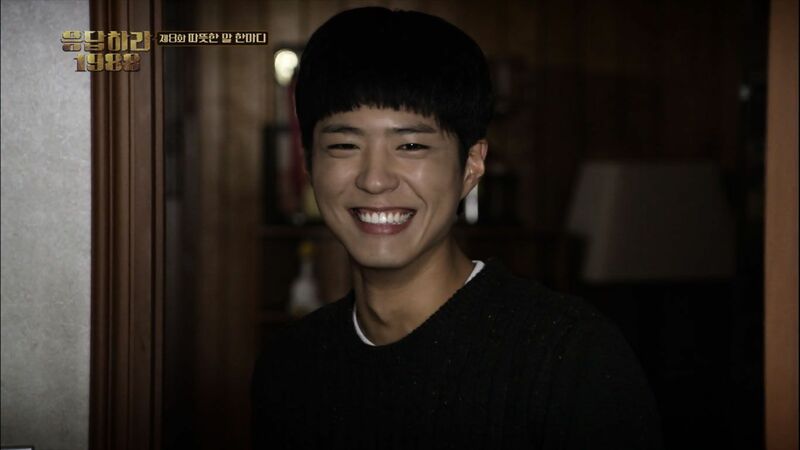 In this episode, Dong Ryong barged into Taek's house to play the marble board game with Taek. Duk Seon stopped him from interrupting Taek as he had an upcoming match he needed to focus on. She knew Taek was busy, but she interrupted him anyway. How many times had she asked him to play that rubix cube with her - testing him on how fast and how many times he could get it right? Taek had an upcoming match, and according to his dad, it was an important one because he was to go against a rookie, and rookies were his weaknesses. Taek let Duk Seon stay in his room, neverthless, and even played that rubix cube with her. What happened the following day? Taek lost the match. LOL. Fast forward 9 episodes later, we are now witnessing Duk Seon who shoos anyone away who interrupts Taek prior to his upcoming match. I am just amazed and grateful that I was able to see the changes in them. So much character growth. In addition, Duk Seon learned how to knock on Taek's door before letting herself in - as if to make him aware that of her presence. She even questioned Taek how he was able to tell that it was her on the other side of the door. Taek responded that only she knocked on his door, his dad never did. 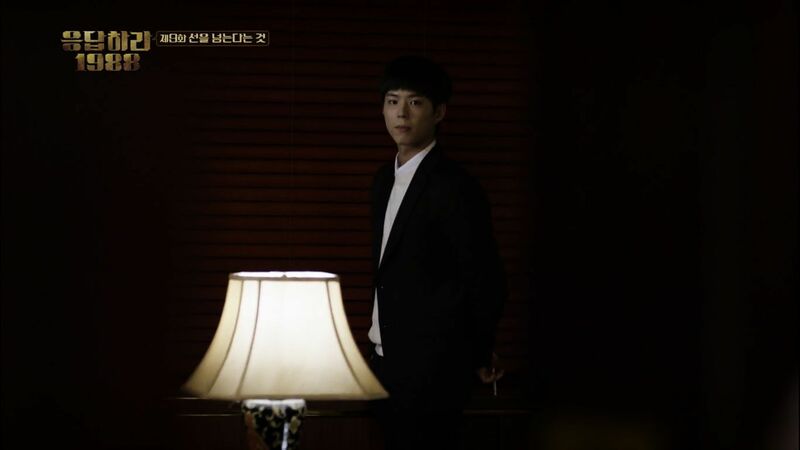 Duk Seon stopped barging into his room since that scene in Ep 9 when she caught him smoking. She learned to respect his space and privacy since then. This scene in Ep 14 was when things got a little dangerous. They were going on a different boundary of their relationship. This was the very first time that either of them talked about a person they liked. Duk Seon claimed that that she knew Taek from head to toe, so there was no way she wouldn't know if there was somebody he liked. That alarmed and hurt Taek at the same time because she obviously had never felt his big and deep affection to her all this time. 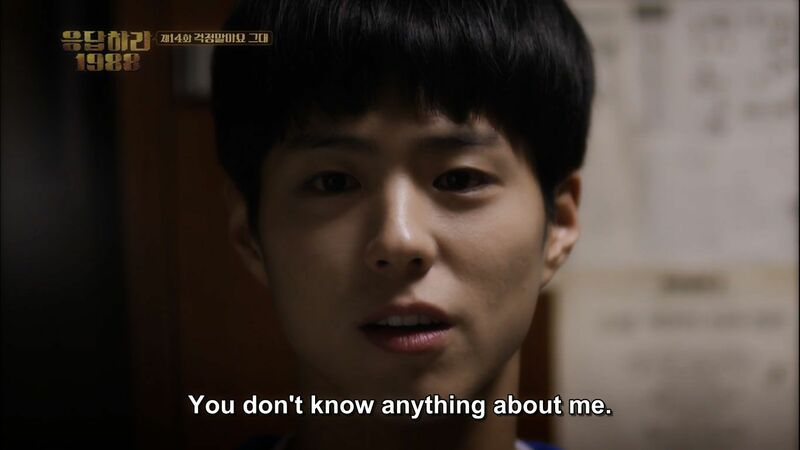 "You don't know anything about me", Taek claimed. It hurt him that it never even crossed her mind that he might have deeper feelings for her. She shut him down even before he did something to prove her otherwise. 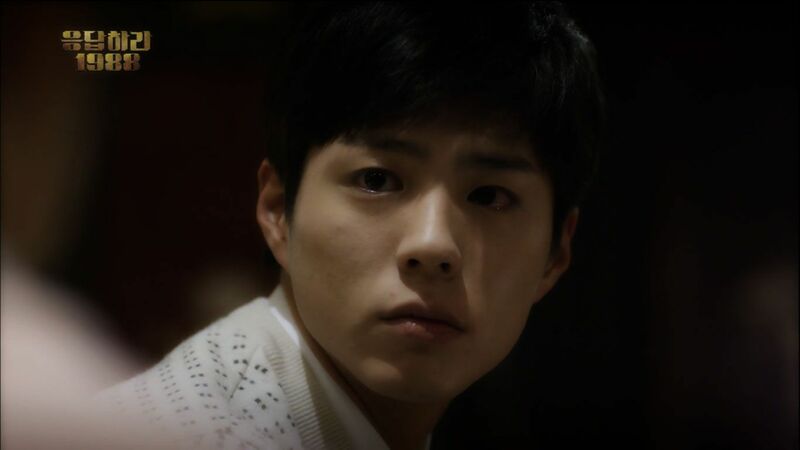 In Episode 15, Taek expressed that concern to Sun Woo that Duk Seon might not believe him should he confessed. His confidence wavered when Duk Seon claimed that there was nothing she didn't know about him. What else could he do to convince Duk Seon of his feelings for her? This scene in episode 16 left such an impact on me. This was the moment where I had decided to fully jump ship on this "sinking" SunTaek ship. Most viewers saw it as a sinking ship, but it actually gave me a sign and hope that perhaps all those little but memorable scenes of Taek and Duk Seon in previous episodes had been building up for something grand. A big change - realization - was about to happen in their relationship. It was all thanks to Duk Seon who gave away her feelings the night Taek bailed on their supposed "date". This scene right here made me convinced that Duk Seon had been keeping something from us all this time. She looked so vulnerable at that state. She said it was okay that he couldn't fulfill his promise to meet the following morning, but she obviously was not okay! She was so disappointed (I mean, she had been waiting, anticipating for his call all night long) that Taek had cancelled out on her. Both of them went to bed with a heavy heart that night. And this was why I decided to fully board the SunTaek ship at that moment because Duk Seon had let me in to her privy thoughts. She didn't have to say the words, but actions were louder than words. Something about Taek not fulfilling his promise made her show this kind of expression. She wasn't angry, didn't blow up at Taek for his empty promises, neither did she let anyone know that she was in a bad mood. She did none of that. She kept the innner disappointment all to herself that night. At the beginning of Episode 17, it made me feel giddy that Duk Seon still kept pondering over the fact that Taek had bailed on her. She had questioned once again her worth because even Taek had made her feel unwated and someone who could easily be thrown away when something more important had come up. Her self-esteem had plummeted once again realizing that she wasn't a priority to anyone, not even to Taek. This scene was so cute because Duk Seon has once again shown her self-consciousness around Taek. But this time, I think she was doing it consciously. Taek asked her to hop on his back, so he could bring her back home. Duk Seon did not want to as Dong Ryong's complain at how heavy she was to carry on the back registered in her mind. She became shy at the fact that Taek would feel her "over" weight body, and she didn't like that. It didn't help that this was the first time they met since Taek cancelled out on her - they looked adorably awkward! 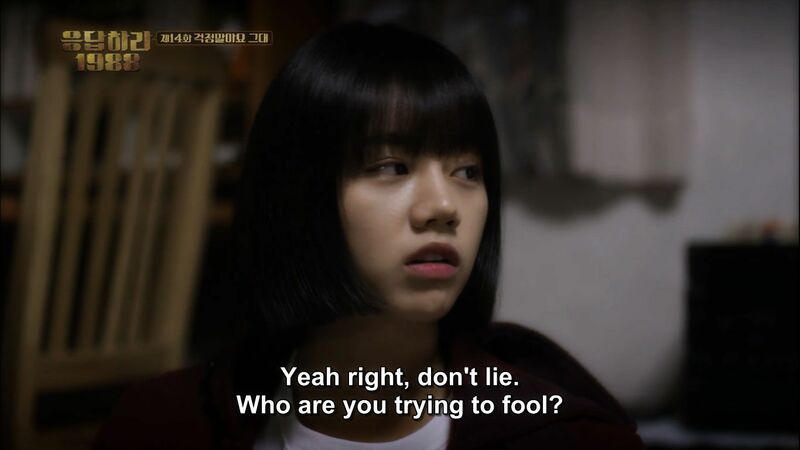 But like I said, anytime Duk Seon wavers, Taek immediately steps in and casts away her doubts. He scooped her up in his arms and carried her across the field as if she weighed nothing at all. Duk Seon was all flustered, but her long gazes at Taek as he carried her in his arms did not escape me. The close proximity between them was becoming overwhelming, but she couldn't look away. She just stared at him with that look on her face. What happened that morning was all Duk Seon had ever thought of all day and night long. Her mind was busy reminiscing how Taek scooped her in his arms and how manly must that moment had been in her mind. The dream-like kiss! Okay, well, we already know that this wasn't a dream, so I`m just going to jump right ahead as to why this is my most favourite SunTaek scene ever. All of their scenes are my favourites, but this took home the gold. As I had mentioned previously back in Ep 12, when Duk Seon and Taek talked about the person they liked - they had stepped on a new boundary. It was something that never came up whenever they were togetheer until Ep 12. It just amazed me that they had come this far into their relationship. That kiss right there sealed the deal that they were already at that age where they were attracted to each other as more than friends. That they were already at that age that they saw each other as "a man and a woman". They shared a kiss they mutually consented because their feelings for each other had already gone beyond than "bestfriends". Every time I watch this scene, I am reminded that they were bestfriends who, one day, became “man and woman” in each other’s eyes. They’ve always had that tension around them. They could feel it, but always brushed it off. But that first kiss sealed it – finally they had acted on that “tension”. It was the only missing thing in their relationship. It was just…. beautiful. So beautiful. You don't even need to explain why this scene is beautiful. A picture is worth a thousand words. The event leading up to that first kiss is worth mentioning too. Taek had asked her to go home as he was going to sleep. She said yes she would. But look at how much she stalled - turned back to Taek again giving him such a longing look. She wanted to say something, but words failed her. She didn't want to go "home". Where else could she go? Taek was her home. This scene right here goes back to that scene in Ep 11 where I mentioned that Duk Seon she would exchange all the fun in the world just to have a moment with him. Where is seriously the fun in watching someone asleep? But here was Duk Seon who didn't want to go home, wanted to spend more time just sitting by Taek as he was in deep slumber. The world isn't fun to her if there's no Taek in it. This was her home - with Taek, there was peace and happiness within her. To her, sitting by him makes up all the fun in the world. She feel complete with him. He was her other half right from the start. Seriously, I think I had tears in my eyes everytime I watch this scene. Just so beautiful. Fast forward to 6 years later... year 1994. I personally think Duk Seon and Taek's relationship never got strained in the 6 years that had passed since their first kiss. The Ssangmundong kids grew up and went into the real world. Jung Hwan moved out and became an air force pilot, Sun Woo spent the most of his time at the hospital studying medicine, Dong Ryong helped out with his brother's restaurant, and Duk Seon became a flight attendant. In all these years and the storyline proved it as well that it was only Taek and Duk Seon who never left the neighbourhood. In Ep 19, we saw that everytime Duk Seon was back home, she would still spend the time in Taek's room, and this time with beer! Their relationship never became strained, in fact, they even became much closer in the 6 years that they busied themselves at work. Duk Seon and Taek's world outside Ssangmundong had clashed - Duk Seon knew each and every one in Baduk. The chief manager was very fond of her - this was the very first time I had seen them together and talked in familiar tones as if they had known each other for a while. In addition, the second manager that Duk Seon went to China with was even dating Duk Seon's co-worker; it was Duk Seon who introduced the two of them together. As I had mentioned, their worlds outside Ssangmundong had even become one. 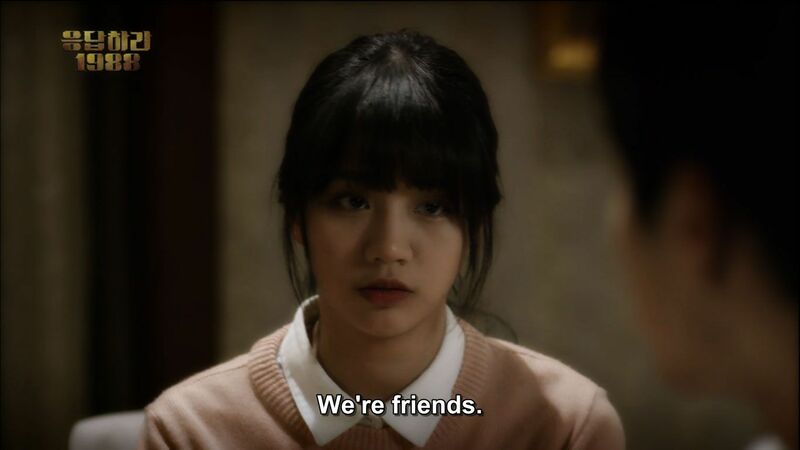 I`m pretty sure that baduk match in China in Ep 19 wasn't the first time either that Taek and Duk Seon had met overseas due to their work. That showed how much closer they became even though they had put their feelings aside for the sake of their friendship. It must have hurt so much for Taek to hear that Duk Seon had gone on different dates, and vice versa that for Duk Seon to read in the newspapers and stories from the boys that Taek was seeing somebody. 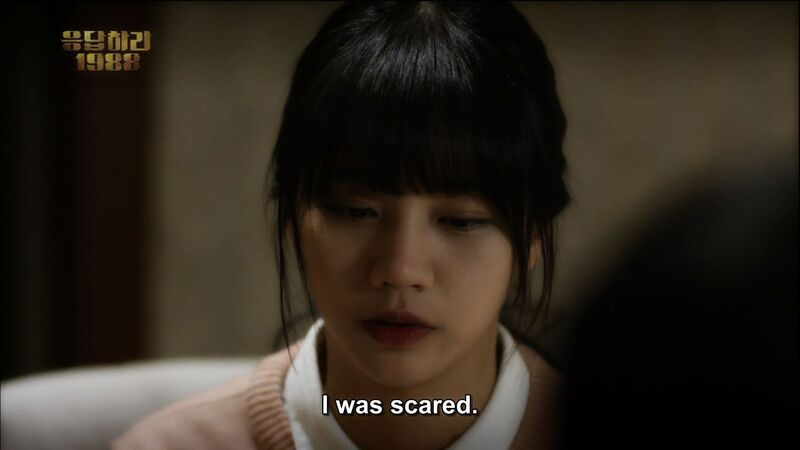 They turned a blind eye to their feelings the moment Duk Seon denied what had happened that night 6 years ago and when Taek took a step back and didn't confess. It was agonizing to watch them with those long empty gazes. But remember when I said that everytime Duk Seon shows that she wavers, Taek is quick to act on it and washes her doubts away? It had happened again in the crucial moment in their relationship. In Ep 19, Taek and Duk Seon talked about the "dream kiss". Taek asked as to why she lied and let that moment passed 6 years ago. Duk Seon had once again put Taek and her relationship with him first before her. She pictured different scenarios in her head on what could have happened if she told him that they shared a kiss. She had imagined the worst - a world without Taek - and she had once again exchanged all the fun it could have been had she told the truth because she didn't want a life without him. It hurt, but she was fine staying friends forever with him. It hurt to hear news about him dating, but she was fine as long as she could still hang out with him. It hurt to go out with guys she didn't like, but she was fine as long as at the end of the day, there's Taek she could have drinks with when the dates were over. I think this also goes back again to that time that Taek cancelled on her in Ep 16. Her dilemma of the fact that Taek didn't make her a priority - she didn't have the confidence that Taek's feelings for her were that deep. What if that kiss was only fluke? How much more her self-esteem could take if Taek didn't want her the way she longed and wanted him? 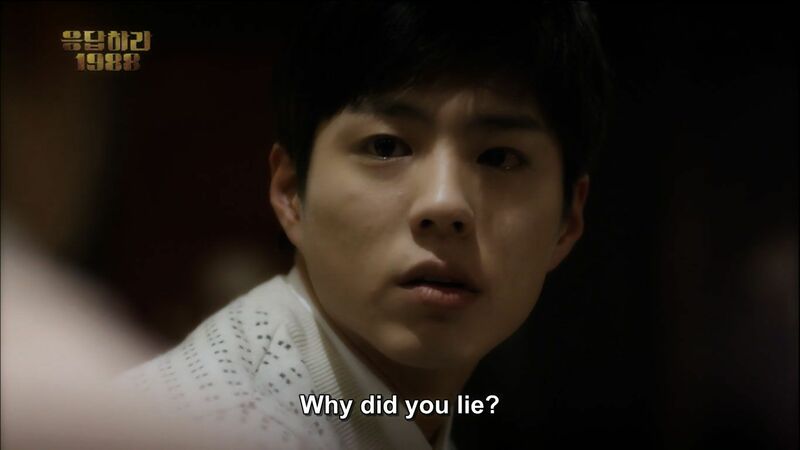 Whenever Duk Seon expressed her doubts to Taek, he was always quick to assure her otherwise. This moment sealed their future of forever right there. 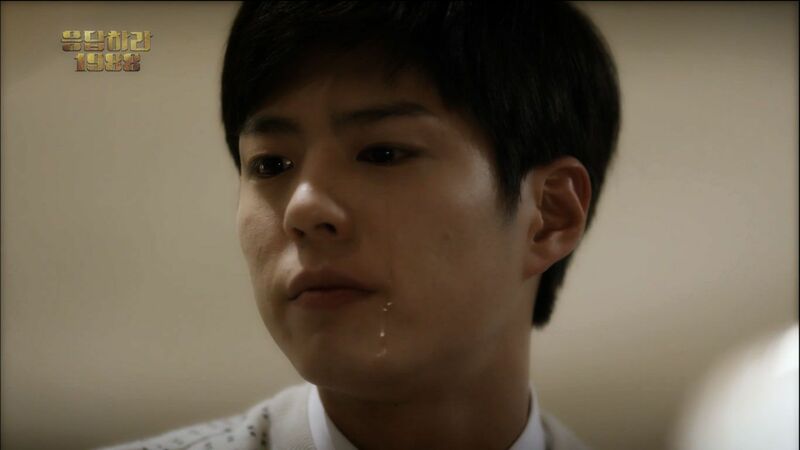 Duk Seon wavered in her faith in their relationship, but Taek jumped up and showed her that his feelings run so deep. He showed her how much she mattered to him - how deep his love was to her. He didn't waste another moment dilly-dallying again the moment he knew both their feelings had been mutual all this time. He let out a tear out of disappointment, I would say. Disappointment in himself that he let so many opportunities go (Ep 15 and 17) when all this time Duk Seon had been hurting and loving him from a far. 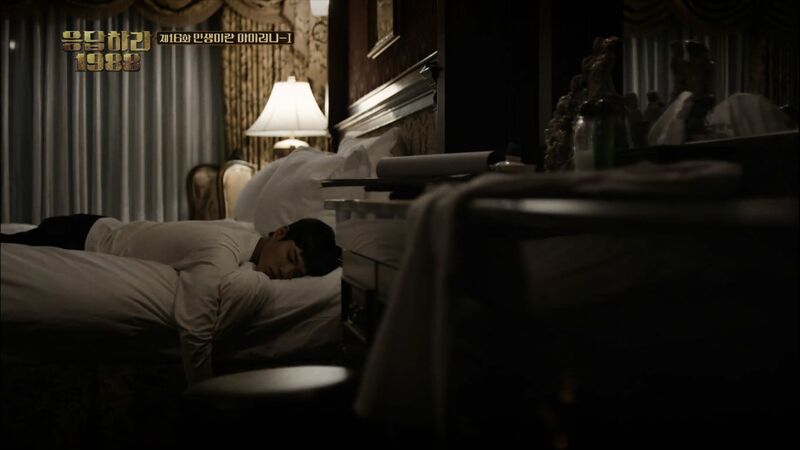 I had once again been given the opportunity to witness Duk Seon's privy thoughts - and this time, her actions showed how much happy and satisfied she was going to bed. Both Taek and Duk Seon would from now on sleep without feeling so heavy and burnt out. As I have said their love story was so beautiful and I could go on forever to talk about how match made in heaven Duk Seon and Taek are. 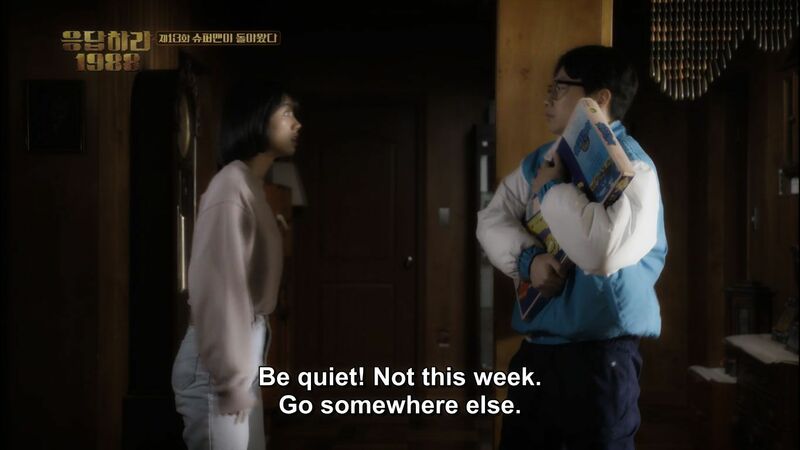 There are a lot more scenes in the drama that I didn't go over in this post, but they surely are worth dissecting and talking about as well.... I wish I had all the time in the world to do that, but for now, these are the things that highlighted the strong bond between Duk Seon and Taek. Their future together had been sealed. to get back to each other. some things still never change. There will always be love and adoration between them. 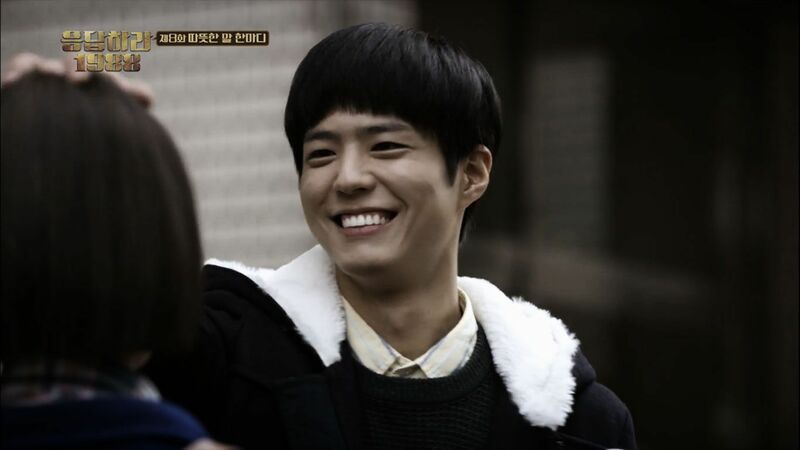 Reply 1988, Ssangmundong neighbourhood, Taek and Duk Seon - you`ll always have a special place in my heart.